Expand your horizons with the latest set of Wings of War booster packs. Each set contains new pilots, planes and maneuver decks perfect for scenario-building as well as casual play. Named after the incredible WWI pilot Max Immelmann, The Wings of War: Immelmann booster set includes three new Maneuver Decks, G, P and P, and new planes such as the Fokker A.III/E.III which was flown by Immelman himself. The set also contains the Halberstadt D.III, Fokker E.IV, Morane-Saulnier N, as well as many other surprises. 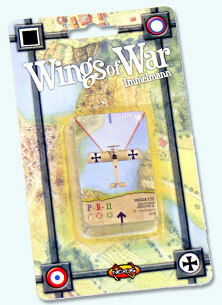 The Immelman booster pack is compatible with any WWI Wings of War game set. This is not a complete game. A copy of any WWI Wings of War base set is required to play.